All the VDCs (45 VDCs and 1 Municipality) of the district is minimal food insecure during this monitoring cycle(July to November, 2013). The crop of paddy and maize across the district (45 VDCs and 1 Municipality) ware harvested which has supported to >80% of households to food stock for more than 4 month. Market stock has been sufficient for more than 4 month although market price has increased by 14% compared to last year this cycle. The production of other agricultural product (Green vegetables, Potatos) was normal. 12000 HH were earned 125 million NPR from sale of agri product. Likewise 2465 HH ware on the revene of livestock and livestock product, they have earned 363 million NPRs from sale of livestock/product during the July - October period. based on report from district statistics office, remittance of the district during this cycle was 232 NPRs which is the normal trend. Local level markets are functional with sufficient food stock to fulfill the public dimand. Wage opportunity from farm activity and construction work (public & private) is created during the period which is normal like previous year. No natural disasters; no epidemic; 91% of Household are accessed to safe water and 48.67% of HH using toilet and 5 VDCs out of 45 VDCs and 1 municipality are declared Out Defication Free. Tradional coping mechanism; generally peaceful situation was observed during this monitoring period." 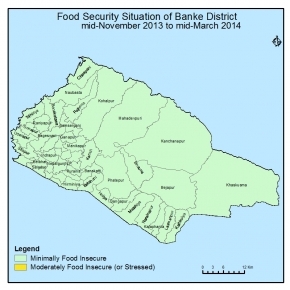 The food security situation is likely to remain same generally food secure (minimal food insecure) in the next cycle. Current household food stock is sufficient for more than 3 months; Supply of food commodities in the key markets seems to be continued; no indications of malnutrition. remmittance flow is likely to continue; HHs will adopt traditional coping mechanism such as consumption of food kept in stock(own production and imported).